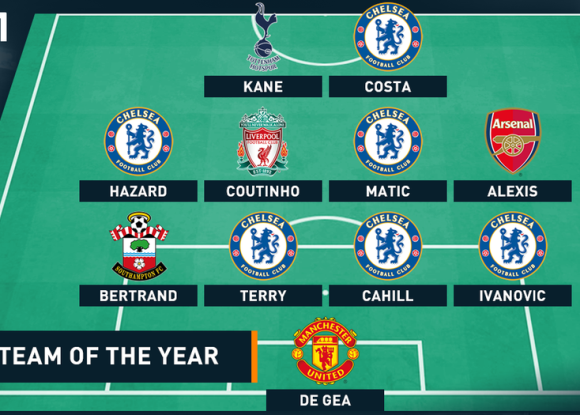 The PFA Team of the Year 2015 (2014/15 season) has been announced, and it includes six Chelsea players, but doesn’t have place for either Cesc Fabregas or Sergio Aguero. Chelsea medio Fabregas currently leads the assists tally for 2014/15, while Man City’s Aguero is the current top goal scorer for this season, but neither, somewhat surprisingly, find a spot in this XI. The team was officially announced on April 26, 2015. "There should have been more Chelsea players. All of them should have been Chelsea," he said. "I respect every player in that team and especially everyone that chose because they have the right to choose. Great players are in that team but also eight players are outside that team. "Just one example is Cesc Fabregas, with the season he is having, the number of assists, the quality of his game. For him not to be there is strange.